For nearly 500 years, Jesuit colleges and universities have made it their mission to educate students of all economic, social and ethnic backgrounds. Several of these institutions were founded specifically to educate immigrants, and continue to provide a home for them today. In light of last week’s announcement on the DACA rescission (which will affect a number of DACA students on our campuses), “serving the under-served” is a timely theme for this month’s issue of Connections. Last week, AJCU issued a statement expressing deep dismay over the Administration’s decision to strip the nation’s 800,000 Dreamers of their DACA status. The full statement can be found here on the AJCU website. Read on to learn the latest news from Capitol Hill. In the following interview, Georgetown Scholarship Program (GSP) graduate Amina Gerrbi (Georgetown University '17) shares her journey from the chaotic streets of Benghazi during the Libyan Revolution to graduation on Healy Lawn this past spring. Furthermore, she elaborates on how her Jesuit education helped her discover her passion for serving others and how she is pursuing that call as an alumna. Loyola University Chicago's Arrupe College was established as a two-year Associate’s degree program to provide a rigorous liberal arts education to motivated students with limited financial resources and an interest in later attending a four-year institution. The College is one of the cornerstones of Loyola’s strategic plan and directly supports its priority to continue extending access to education for those from under-served communities. Just weeks after watching Katie Ledecky and Michael Phelps make swimming history at the 2016 Summer Olympics in Brazil, Brian Loeffler, head coach of men’s and women’s swimming and diving at Loyola University Maryland, found himself at the same pool in Rio with a team of athletes from Loyola ready to compete in the Paralympics. Since 1996, Regis University's Porter-Billups Leadership Academy has helped at-risk and low-income youth from Denver, CO successfully graduate from high school and prepare for college. Last month, Rockhurst University launched a new program in partnership with the Hummel Family Foundation that seeks to help those students who would not otherwise be able to attend Rockhurst. The Hummel Family Scholarship is an annual scholarship program and philanthropic gift plan that could eventually become the largest in University history, with a total of $500,000 awarded to approximately 20 first-time freshman and transfer recipients in its first year of existence. Since its inception in 1953 (under the direction of Rev. Arthur Clarke, S.J. ), the Adult Education Program at Saint Peter's University has evolved into what is now the School of Professional and Continuing Studies (SPCS). The program has moved from offering two nights of classroom instruction to more than 100 classes at night and multiple courses online. But one thing that has not changed is the diversity of the students in the program and the reasons why they enrolled. The Association of Jesuit Colleges and Universities (AJCU) sponsors over 30 conferences (affinity groups) within the AJCU Network. 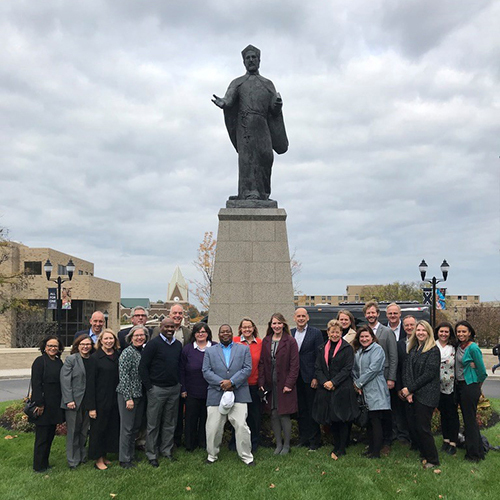 The conferences provide a forum for the exchange of ideas, information and best practices; support the professional development of their members; and present opportunities for AJCU representatives to discuss collaboration and challenges in Jesuit higher education.